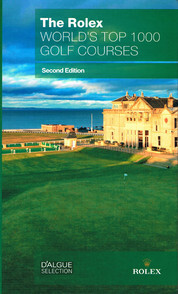 “The Rolex World’s Top 1000 Golf Courses” compiled by Gaëtan Mourgue d’Algue and Bruce Critchley is a tidy, comprehensive well-executed book that is a must-have for any serious golfer who wants information regarding the World’s best golf courses. This is my second copy as I also owned the first edition as I consider it to be such a relevant and valuable resource. This is an interesting and rather massive project that processes the input of about 200 independent golf course observers from around the world to offer such an extensive listing. 2010 saw the first edition appear and with the slow down of new course building, especially in the United States and Europe, there were just 107 new courses changes in the 2012 edition with 35 of them being in the United States. Considering that new course building continues to slow into the future, now is a great time to made the $35 investment in acquiring this interesting piece. From the inclusion of some foreign golf courses, it would appear that there was also the attempt to spread the coverage around geographically, which should be no issue for the traveling golfer. So just what is included? Each course occupies a one-page listing that includes a lengthy one-paragraph description as to why the course is remarkable. Very helpful course and contact information along with and fees & restrictions data is listed with local hotels and interesting local attractions (with phone numbers) complete each listing. Both private and public-access golf courses are included and a local map accompanies each facility. This all makes for a splendid one-stop reference if you might consider trying to play these layouts or simply want to learn more about them. Considered by many to have played more of America’s, Ireland’s, and New Zealand’s best courses than perhaps anyone alive, I would have loved to help with course selection, but no I did not have a say in the process. Overall the editors did a pretty reasonable job. That said, any honest review must include a few critiques. I will comment on one course right in my hometown neighborhood that somehow found its place into the book and has produced a look of shock on the faces of those I pointed it out to. Quite frankly, its inclusion just is so out of wack that I must point it because I live nearby. The course is Poppy Ridge (Merlot & Zinfandel Nines). With deference to my friend Rees Jones and the good folks at the Northern California Golf Association as he is the designer and it is one of their two “Home Golf Course” properties, Poppy Ridge doesn’t belong anywhere near this book. While it is a fun 27-hole layout and a very attractive facility, it is hardly remarkable in comparison to many other California/USA offerings. It is not considered by anyone I am personally acquainted with to be in the top three golf courses in the Livermore Valley or the Top 50 in California, let alone the Top 1,000 in the World. The layout in unwalkable for most. Its three nines lack any distinctive memorability and generally it is not even favored for repeat play without its discounts. That said, the Poppy Ridge is fun, a good value, and a very positive part of the Northern California golf scene, but no combinations of nines make for an elite golf course worthy of this book. There also seems to be a preponderance of Tom Fazio-designs, many of which also perplex me, as they are so similar to one another in look and play, but that is the editor’s choice. Courses such as The Rim, Saddle Creek, Fenway, Manufacturer’s, Desert Forest, The Course at Wente Vineyards, Glen Mills, Bayonet, Caledonia Golf and Fish Club, and a few dozen more (picture the Northeastern U.S. for starters) leap into my mind as being infinitely more deserving within America than an equal number of those listed. Of course, any course rankings and works like this will always foster healthy debate as to what courses make it and which ones didn’t, and that’s half the fun. The real point is the “Rolex World’s Top 1,000 Golf Courses” does include an outstanding menu of layouts, easily referenced, and well-documented. It will be a valuable addition to anyone hoping to engineer a round of golf at them or simply wanting to learn more. I highly recommend it.